Testing the Textus Receptus: Rev. 16:5 – King James Only? Before I go on to dealing with the evidence, let me offer a scan of Philip Comfort’s New Testament Text and Translation Commentary (Tyndale House: 2008) at this point. Comfort incorrectly claims the TR and the KJV read the same as other English Bibles here. He goes on to discuss the manuscript evidence, however, for the few minor variants in the manuscripts related to this reading. He actually assumes that “and” is the original reading, albeit coupled with osios (holy). Now in the face of this evidence, TR Onlyists have some explaining to do. A few defenders of the TR are refreshingly honest about the evidence. 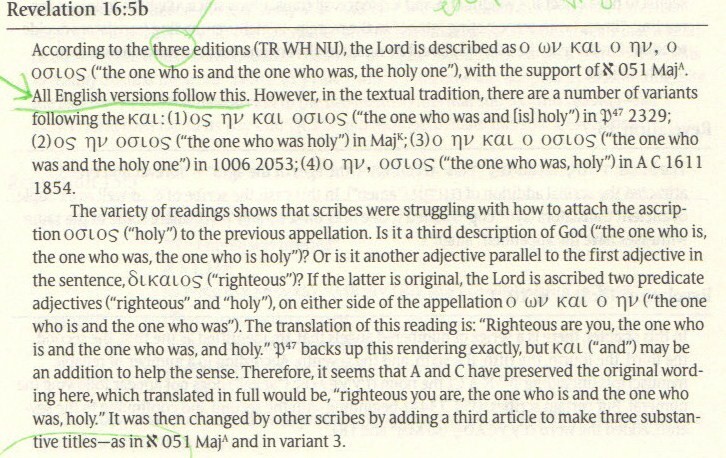 Hills lists this passage as one of the few “certainly erroneous” errors in the King James Version (which is “not ideally but practically” perfect) [E.F. Hills, Believing Bible Study (Christian Research Press, 3rd edition) pg. 83]. He also cites this passage as one of only two conjectural emendations Beza introduced to the TR which “were perpetuated in the King James Version”. He goes on to say, “In the development of the Textus Receptus the influence of the common faith kept conjectural emendation down to a minimum.” [Believing Bible Study, pg. 206]. To the best of our knowledge, there is no extant manuscript that testifies to the reading ????????. While an 8th century Latin commentary on Revelation produced by Beatus of Liebana contains the phrase “qui fuisti et futures es” when referring to 16:5, it appears that, based upon his comments, Beza made this emendation for other reasons. Therefore we came to the conclusion that Beza changed the text from ????? to ???????? in his 5th edition and the KJV translators made use of it. It is interesting to note that the Elzevir Greek New Testament published in 1624, after the King James Version and many years after Beza’s Greek New Testament did not include Beza’s conjectural emendation. However, when Scrivener prepared his Greek New Testament corresponding to the Greek text underlying the KJV in 1876, he followed the text of English KJV Bible: “shalt be”. Thomas Holland seems somewhat tentative about Rev. 16:5. He points out that the modern versions don’t go with the TR’s “and”. He also seems to say that since there are various textual variants (surrounding the “and” and a few other minor points, see below), conjectural emendation is warranted, especially in light of the worn section in the text Beza was using as well as in that place in P47. Other TR Only and KJV Only writers are anything but tentative however. They seem to take this reading in stride as if it doesn’t prove anything. Rather than admit that there may be one minor error in the KJV, they go to great pains to defend it. See for yourself if the following quotes are warranted given the above evidence. The King James Bible translators did not slavishly follow Beza’s Greek text, but after much prayer, study and comparison, did include Beza’s reading of “and shalt be” in Revelation 16:5. We do not know what other Greek texts the KJB translators possessed at that time that may have helped them in their decisions. They then passed this reading on to future generations in the greatest Bible ever written. Since God has clearly placed His mark of divine approval upon the KJB throughout the last 400 years, I trust that He providentially guided the translators to give us His true words. — Will Kinney on this thread (post #7). The KJV reading is in harmony with the four other places in Revelation where this phrase is found…. Indeed Christ is the Holy One, but in the Scriptures of the Apostle John the title is found only once (1 John. 2:20), and there, a totally different Greek word is used. The Preface to the Authorised Version reads: “with the former translations diligently compared and revised”. The translators must have felt there was good reason to insert these words though it ran counter to much external evidence. They obviously did not believe the charge made today that Beza inserted it on the basis of conjectural emendation. They knew that they were translating the Word of God, and so do we. The logic of faith should lead us to see God’s guiding providence in a passage such as this. — Jack Moorman in When the KJV Departs from the So-Called Majority Text (Bible for Today: 1988), pg. 102. Moorman, whose work is full of every possible manuscript listing available to put down as evidence for the KJV readings, offers no evidence of any kind for this reading, except for Beza’s text. These first two quotes beg the question. It is possible the KJV translators could have labored long and hard over that reading and then accepted Beza’s reading. It is equally possible that it being an insignificant variant that was not listed in Stephanus’ textual apparatus they had, and with other thoughts on their mind, they may have just adopted Beza’s reading without too much thought. They could have been convinced by his note that he must be correct and just moved on. Did they pray about the reading? How do we know? Could we grant they erred along with Beza on this? The [“and shalt be”] portion is ELIMINATED in the Greek text and English versions specified above. Again, the removal of “and shalt be,” puts in doubt the eternal future of the Lord Jesus Christ. This is certainly a matter of doctrine and theology. At this point, this Greek text and these English versions are theologically deficient, whereas the Textus Receptus and the KING JAMES BIBLE are theologically superior. — D.A. Waite in Defending the King James Bible (Bible for Today Press: 1999 edition), pg. 167 (bold and all caps are his). Waite never mentions in this section the fact that the TR is split on this verse, and all English Bibles prior to the KJB did not have this reading. Erasmus did not use conjecture like the critical text people so often do. The King James and the Textus Receptus is correct. There is no problem with that rendering of Rev. 16:5. If you look at Dr. Jack Moorman’s excellent book, When the King James Bible Departs from the So-Called Majority Text, you can turn to page 102. Dr. Moorman says,… — D.A. Waite, in Central Seminary Refuted on Bible Versions (Bible for Today Press: 1999), pg. 71. Waite goes on to quote what I already did above, from Moorman. These quotes seem to belie a refusal to consider the manuscript evidence. In the first one, Waite irresponsibly ignores the TR split on the verse, and in the second quote, he dismisses out of hand any objection by offering a quote. Problem is the quote is just another opinion offering no proof at all for why this verse is not an emendation. How do we know? We’ve got promises of preservation in Scripture. That’s one way of knowing things. That’s how I know justification, Trinity, and all my other doctrines. And I see it as sufficient. And then we’ve a note written by Bezae next to Revelation 16:5 about conjectural emendation. You gravitate to that note. Of course, it is true. The promises are less true than that experience of Bezae. Well, I believe the promises, so when I read Bezae, I hear this: 1) We’re talking about one Greek word. Yes, that’s important (you call it “powerful.” Powerful? Why isn’t the fact that the critical text leaves out “Lord” in Rev. 16:5, powerful? Tyndale and the TR and the KJV and the Geneva Bible all say “Lord,” but the NASV leaves it out completely. Is that powerful?). Part of the explanation of the emendation is that the manuscript was worn, faded, difficult to read. Hosios and esomenos look very much like each other. He sees esomenos to fit the context of the verse and of Revelation. A present participle of eimi, a kai, an imperfect participle of eimi, a kai, and then a future participle of eimi—as opposed to, present, imperfect, and then out of nowhere, an adjective, hosios. It’s only conjectural because the physical copy itself was worn and difficult to read. 2) He has Latin that backs up esomenos. I don’t discount translations. 3) The KJV translators had who knows what in the way of manuscripts. We don’t know. They believe that esomenos is correct. 4) The churches used and preached ‘eseomenos,’ the future, masculine, singular, participle of eimi. That is powerful that they accepted that. Just like it was powerful that they accepted the 66 books. This is where I stand right now on Rev. 16:5. If I work a little harder, I believe it will become more clear to me. — Kent Brandenburg, author and editor of Thou Shalt Keep Them (Pillar and Ground Publishing: 2003), in his blog comments here. Revelation 16:5 goes after one word essentially, yes. And that one word is enough to drive a whole history of textual criticism through and an acceptance of a Sinaticus and Vaticanus? That is a problem in light of what Scripture teaches on separation. I think you have to harmonize your view with a Biblical Theology of Scripture. I don’t get that from the other side today. — Kent Brandenburg in this comment earlier under the same post. I can respect the faithful attitude and expectation that it’ll all work out in the end here. But, once more the manuscript evidence is brushed aside. This time an emphasis on the churches accepting “and shalt be” is given. What about the churches for 200 years previous to the KJV? And when the churches used the KJV, was their use of it a tacit approval of each and every reading in it? In fact the churches in Europe preferred Elzevir’s 1633 TR, and the churches in England preferred the Stephanus (or Stephen’s) 1550 TR. Neither of these has esomenos. While the Elzevir’s 1633 did contain this reading, subsequent Elzevir’s editions do not. There was no TR based off of the English until Oxford’s 1825 edition. Prior to that time, if the pastors of the churches preached out of the Greek (arguably, most would have) they would not have normally been using Beza’s edition, in England they would have used Stephanus. So how can we say the churches accepted this reading? As for driving a whole history of textual criticism and acceptance of Aleph and B through this one word in Rev. 16:5, I can see the point. Still if the KJV is not perfect, and if the TR is not perfect, why should it matter if all the words are in one book or not? In principle, this is the same as my position, namely that all the words of Scripture are preserved, in the plethora of available manuscripts, early translations and other textual evidence we have today. Clearly Rev. 16:5 is not enough to debunk a TR preferred view such as the RBS displays above. But it is enough to derail some of the more radical elements of KJV Onlyism. After all, each word and each reading is important. Anyway you cut it, in my opinion, the evidence is clear. Beza added this into the text erroneously. Almost all later Greek texts did not follow his lead. Earlier texts didn’t either. Bibles before and after 1611 do not have the reading “and shalt be”. The testimony of the church in all other languages, had followed the reading “Holy One”, as far as we know all down to Beza’s time. Here again, as in Luke 2:22, the TR fails the test of perfection. Most TR Only advocates claim either a single TR edition or the KJV itself is indeed without error. If it is without error, only special revelation would lead us to confidently say so, given this passage. *Note I updated this to reflect new information shared in this comment, and confirmed by my research as noted here. Thanks Scott Henry (via Facebook, which I can’t login to from work), for pointing out my last sentence was half finished. I completed this post early this morning and must have overlooked that. I edited that line, and it should be good now! You don’t represent our position properly. I have written my position all over. It isn’t represented by an answer for a question you ask on one particular text. What’s interesting too about your position is that you, as well as all other critical or eclectic text guys, don’t take your position from a scriptural bibliology. You take your position from an attack on a scriptural bibliology. Your position isn’t historic either. It is based on Warfield’s revision of the Westminster Confession. No, I’m not presenting your entire position here, I’m focusing on what you’ve written on this passage. Am I wrong in quoting this? Do you have more to say beyond the quotes I give? I give quite a lot of space to your view here, and do try my best to present it accurately in the space I have here in this particular post about this particular reading. Yes, you misrepresent it overall. Do you do this in purpose? I actually don’t think so. I think you do it because you have a one track mind on this now and you don’t take a step back to see what’s going on. I haven’t written any more than something in a comment section and you do well enough because you link to the comment, so someone could read the whole thing, but you cut off the comment in time for certain crucial information. Plus you drop into a context of one variable is enough to sin perfect preservation. We’ve never said that perfect preservation is found in one bound copy. We’ve said first that all the Words will be preserved, accessible for every generation. You’re view contradicts that scriptural presupposition. That, by the way, is also the position of the WC and the LBC. No one, Daniel Wallace, Frank Turk, anyone that I’ve debated, has said that is false with plenty opportunity to do so. That should bother them that they have a novel bibliology to fit their post-enlightnment forensic science, but it doesn’t. They stagger in unbelief. Wordsworth also points out that in Revelation 16:5, Beatus of Liebana (who compiled a commentary on the book of Revelation) uses the Latin phrase “qui fuisti et futures es.” This gives some additional evidence for the Greek reading by Beza (although he apparently drew his conclusion for other reasons). Beatus compiled his commentary in 786 AD. Furthermore, Beatus was not writing his own commentary. Instead he was making a compilation and thus preserving the work of Tyconius, who wrote his commentary on Revelation around 380 AD (The Text of the NT, Aland and Aland, 211 and 216. Altaner, 437. Wordsword, 533.). So, it would seem that as early as 786, and possibly even as early as 380, their was an Old Latin text which read as Beza’s Greek text does. Third, the KJV translators had Tyndale. They had Stephanus. They relied on Tyndale obviously many times. Here they go away from what he did. Why? I trust they had a good reason, one that I’m not fully privy too. Fourth, the churches did agree on the Beza reading for hundreds of years. One Latin commentary which Beza does not reference is your evidence. Beza doesn’t clearly state his copy in Greek was worn in this spot. We can guess what the KJV translators had, but if they had such evidence which led them to adopt the reading, why did the Elzevir’s TR go back to Stephanus’ reading? What entails “the churches [agreeing] on the Beza reading”? The Greek text preferred by English pastors was Stephanus’ text, the Greek text preferred by other European pastors was Elzevir’s. These were the two standard texts of the day, Beza’s wasn’t the standard. It took over 75 years for the KJV 1611 to be accepted as dominant over and against the Geneva Bible, which did not have Beza’s reading. So what exactly is the church’s unanimous testimony on this variant? Does accepting the KJV as an excellent translation of the representative Greek text of the day (the only widely available and respected text of the day) entail an accepting of each and every minor textual choice of the KJV? I’m sorry, but I’m not ashamed to reject the reading based on such slim evidence. This also brings up the point of every single Greek manuscript which we have today, that contains Revelation, as now being deficient in this one point since none had this reading. Therefore none can be trusted in any of their other readings, one could conclude. Thanks for explaining yourself and your position further. Scripture would have us believe that there are only one set of Words of God. We don’t have more than one Bible. We don’t have a basis from Scripture to believe we must restore it. You don’t answer those principles. You are like a heat seeking missile for something like Rev 16:5 to make room for what? What? Really. The Geneva Bible fell off fast relative to history, but we’re still talking about the TR for all the Bibles. The differences are very, very smile between the TR editions. I believe in perfection because that is the standard of scripture, but you say that you are not ashamed to reject a reading. That’s not all you do, Bob. You use a text that is at lest 5% different than the text received by the churches. That doesn’t fit what scripture says about preservation. That discounts the historic position. You don’t answer the scriptural points I make, Bob. You don’t. Why not believe them? And as far as Stephanus and Elzevir being the text of English and European pastors (of course it couldn’t be the words behind the version that the pastors actually used) is based on what evidence? I would have heard this one from you before, so this is something new that you obviously have read somewhere. It isn’t based on primary source evidence. I’m supposed to visualize men preaching to English speaking people from a text that followed more closely Beza than any other and they are referring to words that are not a basis for what the people are reading? On the other hand, how different are Beza and Stephanus, Bob? What I’m looking for anyone to accept Bob is what the Bible teaches on its own preservation and that doesn’t allow an eclectic or critical text view, which is what you have. And I want to know why it is we’re supposed to reject now the historic view, which is based on sound exegesis of passages on the preservation of scripture. Scripture would have us believe that there are only one set of Words of God. We don’t have more than one Bible. There has never been a period of time where it is entirely clear what is the single scripture. Most popular, most respected, most authoritative, most accurate… pick any date and any version and it will miss one of those criteria. I’m not addressing your “biblical” arguments, because this focuses on Rev. 16:5. This whole blog is an answer to them. I’m not convinced that Scripture promises every Word of God is equally certain and available to all. I believe preservation of God’s Word is promised generally and not specifically. We plan to flesh out such discussions in future posts. You ask where I get the idea that in England the 1550 text of Stephanus was the standard, and in Europe Elzevir’s was standard. That’s a good question and here is some evidence for that point. I found at Wikipidea (which had to derive this info from some scholarly source) the following about Stephanus’ 3rd edition (known as the Editio Regia): “The third edition became for many people, especially in England, the normative text of the Greek New Testament. It maintained this position until 1880.” Also at Wikipedia on the TR, it mentions that John Mill used the Stephanus 3rd edition as the base of his 1707 text, linking his more extensive textual apparatus (30,000 variants) to it. The signifcance of this should be relevant, I would think. You advocate that pastors should know Greek and work from the Greek text when understanding how a passage works. I’ve heard you often refer to the Greek in sermons, and explain from your knowledge of the Greek how phrases, words, and passages should be understood. I understand you consider this to be complementing the English text rather than correcting it. I have no problems with that, except to say that prior to Oxford’s 1825 TR there wasn’t a popularly available text that purported to provide the exact Greek basis of the KJV. So, if pastors preferred to use Greek directly, (which more of them did in years gone by than do currently) and if these two texts were considered standards. Is it not likely that their acceptance and use of these texts qualifies their acceptance of the KJV? You also ask about the differences between Beza and Stephanus. According to Hills, it is said to be 38 differences (pg. 165). I believe the KJV differs from Beza’s text 180 some times, and Stephanus’ 200 some. I don’t have my books available to me right now. Yes that difference is small. And we are talking about one small variant in one small verse. But the question remains how to decide upon this variant. To fall back on a church-acceptance of the English KJV is to use acceptance to too fine a degree I argue. Their acceptance of it doesn’t extend down to each and every small point like this one. The fact that the churches and church leaders were the market for the printing of TRs, and the fact that Beza’s reading at this point was abandoned and not preferred, to me says more than the fact that the KJV 1611 (which was produced before the next major Greek edition: Elzevir’s came out) adopts Beza’s speculative reading. The problem with not bringing in the Biblical arguments is that it buttresses everything we believe about this. You have presuppositions that do the same. If you are a textual critic, you are against allowing your theology to affect your textual criticism. I take the historic position on this, that my theology does affect my view of what the text is, first and foremost. You can say that it is unrelated, but it is. If someone believed it was “holy one” in Rev 16:5, that wouldn’t be a separating issue with me, that is, that they believed that God’s Words were available, which they obviously were in the two TR editions and in the translations of the day. Scriptural presuppositions tell me that it is “and shall be.” You didn’t include the textual evidence referred to by the Alands. Your presuppositions lead you all the way. Even your saying that Wikipedia HAD to derive information that you like from a scholarly source. Really? If you didn’t like it, I’m imagining you saying that it is “only Wikipedia, so consider the source.” And this reveals the nature of looking at extra scriptural “evidence” to come to your position on the text. You won’t have a perfect Bible in the end. And you are then taken down the path of doubt. Instead of unifying on all the doctrines, we unify around the lowest common denominator. After all, we can’t be sure, so we must be “charitable” (i.e., tolerant). I think what the pastors are studying is important and nice, but they’re going to know, if they really do know Greek, that the Greek word was a different Greek word. I haven’t done the work on this yet, but I’m preparing to show in the future after some more research, that pastors did rely on the text behind the KJV for their teaching and preaching. The people, however, agreed on the KJV. It’s not accurate to say that Beza’s reading was abandoned. It is what people were reading in their translation. And then there was more to it in a theological sense than a textual sense. They looked at the other usages of “and shall be” in Revelation. They looked at the syntax. And then there were some textual considerations. This is not textual criticism, which looks at the evidence, forensic science, and then allows that to “lead” us to the truth. That’s what you have adopted. You want Beza to look bad at this point, because it fits your presupposition, one that I can’t wrap my brain around scripturally at all. The Greek that you are criticizing undermines your position on preservation. I don’t consider an apostate church to be the pillar and ground of the truth. I assume that was regarding the 5th century, we still have the problem with the apostles. And if the problem was the apostate church what did the good Christians in Western Europe use in the 5th century? What was the God’s word for them? I take the historic position on this. Note that the RBS’s constructed Greek text is still not found in any known manuscript of the book of Revelation! It differs from the majority by the inclusion of both Κύριε and καὶ. Elzevirs’ … not contain the “and shalt be” reading. ,… The 1633 Elzevir’s text, which earned the title “textus receptus“, reverted to the reading of Stephanus’ and Erasmus’ editions. .. why did the Elzevir’s TR go back to Stephanus’ reading? This seemed a little unusual, so checking Scrivener says very clearly that the 1633 Elzevir has the Beza reading. I’m not sure the origin of the modern error of claiming that the 1633 Elzevir edition does not have ἐσόμενος . Thanks Steven, when I get back to my books (I’m away on a trip right now), I’ll double check that. Now I think it is worth noting that Scrivener (who was by no means a KJB defender) wrote quiet respectfully of the Beza textual choice. While “bold variation” has a note of ambiguity, I take it as respectful, worthy of solid consideration. Personally I think Scrivener looked at the whole Beza quote, including the analyis of the Johannine usage throughout the book and the difficulties of the usual variations and thought the Beza thinking was excellent. Even if Scrivener would not go so far as to comment as to which he directly preferred. Afaik Scrivener never modified the text (Greek or English) in any of his own works as he did in other cases e.g. on Hebrews 10:23 or “strain out a gnat”. Now, Bob, I think you also need to be taken to task for the rather absurd reference to “more than 5700 Greek manuscripts .. more than 10,000 Latin manuscripts” since only a small fraction of those include Revelation 16:5. Thus there is a number finagling which I would expect from an amateur in these discussions. And most of the manuscripts that do have Revelation are quite late, which to your philosophy would make them close to textually irrelevant. Unless you have had a recent Received Text epiphany. As to early references the most fascinating question is generally not asked. Did Theodore Beza know of the Beatus/Tyconius reference ? (Unlike today’s scholars these Reformation Bible scholars were deep readers of the early church writers.) If Beza did know, then it would be wrong to call this a conjectural emendation, since that reference would source as one of the oldest extant on Revelation 16:5. Granted, Beza does not mention the reference in his discussion, however, while good evidence, that alone is not probative that he was unawares. On the other hand, if the Beatus/Tyconius reference was discovered later, unknown to Theodore Beza .. then this later discovery can be seen as a truly remarkable confirmation of the strength of his textual thinking on Revelation 16:5. What needs to highlighted here is the double standard of the King James Only position regarding this variant. If indeed the KJV reading at Rev 16:5 is right, and it is supported by grasping at the possibilities listed above; ie the worn manuscript, the possible early church reference, the Latin, or the mysterious “reason for choice” of the KJV translators which we’ll never know, then the King James Onlyist would be doing the exact thing they claim they despise: restoring the text back to its ‘original’ form after years of another accepted translation. I don’t answer for Bob but you’re right in pointing out the reference to 5700 Greek and 10000 Latin MSS can be misunderstood. I’m sure he’d agree with that as well. What else needs to be highlighted here are two things. 1. Damien and his friends here don’t take the historic or biblical position on the preservation of scripture. They contradict the Westminster Confession, the London Baptist Confession, and the Formula Consensus Helvetica. Daniel Wallace admits that the CT position contradicts the historic position, something Damien and Bob and gang will not admit. They have a brand new doctrine on this. 2. Damien’s comment above again is becoming all too common in misrepresenting the perfect preservation position. It works like the following. If we cannot point someone to a hand made copy, made on parchment, with every Greek word in Scrivener’s, or the same in some written historical information, then that word did not have a textual basis. Nowhere does scripture promise that there will always be a hand-made copy on parchment with every word (fideism?). God said He would preserve His Words. I believe that all the words were on handmade copies, but I don’t see scripture guarantee that we would always have a handmade copy with all of the words in it. I still believe that all the words were on some hand made copy on parchment. That doesn’t guarantee that we would always have all the words on a hand made copy. I would assume that they had some textual evidence in the 16th centuray that we don’t have today. I can’t assume that they didn’t. I believe we have enough historical and textual evidence, but it still comes down to presuppositions and faith. What we do have are many printed editions from the 16th century that now the churches have received as God’s Words, taking the position of perfect preservation and one Bible, guided by the Holy Spirit. What Damien and Bob and others have to say, but you won’t hear (though it would be honest), is that these believers from the 16th and 17th had apostatized on their bibliology, their doctrine of preservation. That Damien and Bob have returned the church to the orthodox position. You guys may as well come out with your statement on that. ok, it’s true. Bob and I have, by ourselves, returned the church to the orthodox position on bibliology. See, I never really wanted to admit it, because I’m a humble guy. But I guess we’ve been exposed for what we really are. I’ll be signing autographs all around the world starting on Monday. Does it bother you that you have a brand new position? It doesn’t fit 2 Peter 1:20-21. I believe that to overturn a historic position we would need a thoroughly studied and explained biblical exegesis to do so, to show the apostasy of the past. That never happened. Instead it was secularism that overturned the biblical position. You can joke about it DT, but it is what you are doing, that is, changing the historic position. Your position didn’t even exist for hundreds of years. So I ask again. Does that bother you? It would me. Would you mind pointing me to a source that documents your position? I’d like to read it. so I take it you don’t want an autograph. ok fine. And look, I do enjoy interacting with you because you are well thought out, stive to be biblical, and know your stuff. I have nothing against you. I don’t really appreciate some of the way you word things because I take it as you thinking you know my motivations (we’ve talked about that before) when you absolutely don’t. But, truly, thank you for causing me to think. I don’t believe the historic position is King James Onlyism. I also don’t believe you’ll find the current view of critical text proponents throughout history. There, I said it. But I don’t grant you that your view has been “the historic position” I believe the church has gone through various stages in her understanding of bibliology, as with other areas of doctrine. Sure, the confessions on which you rely seem to assume the “perfect preservation” view, but can you really claim that as identical to the view you’re espousing? First off , I think neither confession gives a fully developed view of bibliogy and the issue of preservation. Secondly, due to the time period, all the issues therein weren’t known. When the church became acquainted with the textual data, it began to change. You blame this on unbelieveing textual criticism and the enlightenment, but when otherwise orthodox churches, for generations since that time, adopt a different view, why are these disqualified for representing “the church’s view?” If the Lord doesn’t return for another hundred years, won’t that be considered the historic position at some point? See, if it bothers you if one contradicts the theology of the Reformed confessions, should it not bother you that you contradict them on Calvinism, pretribulationalism, or local-church onlyism? Now you would say there’s a “thoroughly studied and explained biblical exegesis to do so” but you wouldn’t grant us the same privilege, even if we have explained, biblically, why one cannot hold to a an exclusive Bible position in light of the fact of how the NT quotes the OT and especially the Lord Jesus’ usage of the OT. I could use the same historical argument on a belief in the universal church. Then you can pull out Michael Sattler. If I pull out a Wycliffe quote that contradicts your preservation view, it won’t count. We’ve done this before, back and forth. At the end of the day, I think I agree more with the London Baptist Confession than you do. But just like you, I think there are parts that are wrong, or at least disagree with. That means I think the church could be wrong. And so do you. Yet, when it comes to these confessions’ statements on the scriptures, you treat them like ex cathedra. I could say, History. But read the Confessions I mentioned and then the Westminster Divines. Read Post Reformation Reformed Dogmatics by Richard Muller. Read my blog by clicking on my name—in the right hand column, I’ve done a lot of articles on this. Just looking at the WC doesn’t yield anything. A surface reading of it would cause me to say that TRO or KJVO would have to be read into it instead of out of it. Will check your stuff out, though. Name someplace I’ve attacked your motives here. I don’t know your motives. And I actually don’t remember talking about that. My memory however could be in the early stages of dementia. I’ve treated you nicely. I haven’t folded up into the fetal position and accepted what you’ve said, but it isn’t personal with you. You gave me a lot of words with very few actually dealing with what I said to you and threw out a red herring with the church issue. I have a historic basis for my church position: Clement I and the Schleitheim Confession. It is a different stream of history than the reformers, but it is history. Regarding the text, you won’t find that alternative belief system represented anywhere in history. I’d be glad for you to point me to a Wycliffe bibliology of preservation somewhere. It doesn’t count to say that he did a translation of the Latin Vulgate, because that’s not the point we’re making here. And you should take into consideration why he translated from the Vulgate at that period in English history. I don’t accept KB’s account of history on this. He is extrapolating his view of what the confessions say. The confessions were birthed out of the movement Calvin started. The Geneva Bible was translated in Calvin’s town after all. And it had direct influence on the KJV. Calvin didn’t accept the TR blindly as a perfect representation of the autographs. He corrected it in places per textual evidence. Beza, his disciple, did the same as evidenced in the notes of his TR editions. Then you have Francis Turretin, who argues for readings from a perspective somewhat similar to textual criticism. Then in the 1600s you have John Mill and the science of textual criticism is born. Many of its early pioneers were respectable men of the church. Tregelles was a conservative textual critic who on the basis of the method current in his day before the publication of Vaticanus and discovery of Sinaiticus, came to conclusions which we adhere to today. You also have Augustine and Jerome as examples of a textual criticism of sorts too, and they aren’t alone when it comes to the church fathers. One other thing to note here. When the English church used the TR and the KJV, KB would have us see this as some kind of ratification or reception of autograph-equivalent words or something. How about we call it they used the best representation of the text that they had. You mean to say no preacher or scholar ever doubted a particular word in the TR ever, or any reading in the KJV? I would assume they did. When it comes to interpreting how we should take the Westminster Confession of Faith and understand it, I have no qualms in trusting a B.B. Warfield more than I trust Kent Brandenburg. Nothing against him, but it is more feasible to assume there wasn’t some mass conspiracy started by Warfield on this point. i took the statement about “returning the church” to the orthodox position a little personal and reminiscent of things we’ve argued in the past but like i said, it’s the wording. ..it’s hard to tell how things are said when they’re typed in a comment box so really, let’s leave it at that. I don’t agree that Clement I and Schleitheim provide a “historic basis” for a position. It’s more like espousing a position and finding little tidbits throughout history to back it up, which, as you’re fully aware, anyone can do with anything. Wesley made predictions of Christ’s return. Spurgeon smoked a cigar. The Reformers sought a church-state union of sorts. It’s cherry picking. The church has to be constantly transformed and reformed by the Word of God. We don’t stop at one time period and judge everything by that. Wycliffe did more than just translate the Bible into English. And by the way, that very act alone coupled with his statements on the Word reveal that he felt he had THE Word. What makes the Westminster divines more right? Were there no political and cultural influences in their day? Also, when warding off the arguments against his decision to translate, Wycliffe interpreted Jesus’ words of “my words shall not pass” as “his knowledge”, hardly an interpretation of a perfect preservationist today. Which is why, though I’ll admit your position has historic merit, I say that your position is not the only view historically. Two words about what Bob wrote: Smoke and Mirrors. See any bibliological statements in there? No. None. Change the subject. Wave the red herring. It’s just something for CT/eclectic guys to latch on to in light of the truth about what the church has believed on preservation. I’ve got this to say to any of you: read Richard A Muller’s Post Reformation Reformed Dogmatics. I’ve said it before. He is a foremost historian. He includes Calvin in his presentation, so you won’t have to take Bob’s They-Used-the-Geneva-Bible! snow job. I have quote after quote that shows exactly what they believed in many articles I’ve done. So don’t believe Bob’s revisionist history of their bibliology. And regarding B. B. Warfield, what was his position Bob? You’d rather believe him. So what was his position? And now is not the time for research and cut and paste. What did he actually believe? I have the 10 volume Warfield set here at home. Do you also believe in evolution like Warfield? He was an evolutionist. Cherry picking? There is no universal church in the Schleitheim Confession. It’s true that I believe that the true church is independent of state churchism and infant sprinkling. However, when I study the history of theology, I look to see if positions existed in history. Clement I is local only and he is very, very early. Schleitheim is really far back as it relates to the printing press. I can explain historically how the universal church position developed. By the way, Bob, I didn’t start the church discussion, but I couldn’t let it go unanswered. 1. He taught at a Presbyterian Seminary, Princeton, which is a scriptural office. Not. 2. He studied in Germany, but he wasn’t influenced by the rationalism there. Not. 3. He wasn’t revising the history of the Westminster divines. Not. Shouldn’t we consider Scripture over Warfield? Shouldn’t we look at history instead of Warfield? I know this discussion is between you and Bob. I just wanted to mention something. I’ve respected much of the tone, etc in your responses until this one. I also pay attention to much that you say and weigh it in the balance. I don’t dismiss it lightly. This reply of yours is bewildering to me, though. Warfield should not be rejected outright due to his teaching at Princeton. John Piper studied in Germany, and I see no influence of rationalism on him. Of course, he doesn’t use the KJV, so by your standards……..
#3 I’m not sure where you’re coming from. Yes, Scripture above Warfield. History above Warfield? He’s part of history. I’m thinking your argument here is not a good one. Why don’t we both get back to sermon prep? It’s Saturday night, and we both love the gospel enough to pray that God will bless us both tomorrow, and we truly need to be ready to preach. I think you guys are interesting in this sense. And it is true that my tone ratchets up with Bob and the like. You don’t like MY arguments. Bob is the one that said insultingly, I’ll go any time with BB Warfield over Brandenburg. Why? Why go with Warfield over me? Does it matter who says it if it is scriptural and historical? Or is it that we judge based merely based on academic reputation? So I gave some truths about Warfield so someone would have a basis to judge besides the bare insult. How much do you know about Warfield’s time in Germany? Warfield isn’t much of history—late 1800s doesn’t constitute history. If you really do weigh things in the balance, then Bob’s last post you would have recognized as not giving any historical bibliological position. He is attempting to prove that textual criticism took place in the past—that’s all. And he gives no context to that—that is, that it was nothing like modern textual criticism—totally different. He doesn’t show any statements of bibliological position. If someone cares about the truth of these things, he is willing to criticize his own side. I don’t see that happening here. Yes, I can see where Bob went over the line somewhat. I guess I forget about the fact that there’s a history with you two. I only wish it wouldn’t shine the way it does at times. On the contrary, however, your statement “you don’t like MY arguments” is fallacious. I stated that I try to weigh your arguments. My mind is not closed. My response answered a little and asked a little. Personally, I have Warfield’s works, but have not read them yet. I have a large library with much material that is yet unread, and I add to it weekly. I simply presented a question in return, only to get a question in return. As far as caring about truth, I reply to you as one who is my elder that perhaps it would serve us all well that you not attribute any motives, cares, or concerns to me that are not readily obvious. Twice in one post you have critiqued my mind and heart. 1. You stated that I did’t like your arguments, though I stated that I try to give them careful consideration. 2. You question my heart for truth because I didn’t call Bob down. Honestly, just by reading, I thought you were a step above the average KJVO fundamentalist. This response truly makes me wonder. I shall allow you to reply/rebut as you please. I have no intentions of discussing any further with one who pretends omniscience about my heart, but won’t check his own tone. Honestly, in all the years of interaction with you in online forums, I’ve never seen this to be true of you and your side. I’d like to think it is true of us. You come out with humongous historical claims that our position has no validity historically. Every time we provide historical verification in part of our position, you claim it isn’t enough. It seems like Damien called you on this before over on your blog, and once again it happens here. As for Warfield versus yourself, it is all about academic reputation. He has more earned degrees and is more respected in the halls of scholarship than you and your positions. Nothing personal, but I’d rather trust a scholar on this one than a pastor who represents a rather novel position from any way you look at it. One day I’ll look at Bavinck or some other more in-depth historical theologies, and I am open to critique. I’m not saying Turretin and the like represent exactly how Evangelicalism today argues with respect to textual criticism. I also don’t think a full blown reasoned eclectism is necessarily correct and I do find benefit to some degree in tracing out a geneaological view of the text. You shouldn’t be surprised by the response you’re getting here. You come busting in with both barrels blasting and call foul at the first discharge aimed your way. Anyway, we’ll let the reader decide, and we hope to flesh out our precise position more perfectly in the future through posts at this blog. This is and has been a major problem with evangelicalism, that is, its fascination with academia. That is originally how German rationalism came into this country, is because of academic pride, placing some kind of hierarchical value on a sacral society, which is willing to jump through the necessary hoops to stay at someplace like Princeton. When we stand before God, it will be worthless. And JasonS, I take your offense as a bit overly sensitive in light of what started the issue, that is, Bob’s authority by Princeton. You can’t create an entire history in one late 19th century moment. The history is still there for the doctrine of perfect preservation. I’m simply answering Bob’s Warfield point, which you should have called if this issue of “tone” were important—and upon that, you say I’m being omniscient with your motive. I judged what he said and your no response to him and yet your response to my reaction to what he said. And then you say that you haven’t read Warfield, making what I said even more true. This is typical CT/eclectic fare, that is, complaining about the “tone.” We don’t agree. And I think all of God’s Words are serious. And I think changing a historic doctrine is serious. “I’ll trust Warfield” doesn’t cut it for me. And believe me, your omniscience shot, and your “just like other KJVOs” are both worse than anything I’ve said to you. So on this one you have no high perch to look down from, JasonS. And Bob, you’ve said this before, that I don’t call people on my side. You have NEVER seen it, you say. I’ve given you examples before. And you’ve retracted it before and now you say it again. And you’ve said the same thing before. I was willing to say that the text behind the NKJV was identical to that behind the KJV, and did say that, until I saw for myself that it wasn’t true. However, I said that I wouldn’t make the NKJV a separating issue, until I saw that was a lie—it is based on a different text, different Greek and Hebrew words. Quite a few times I’ve acquiesced to points you’ve made. We’ve got a lot of discussion online to prove this. I made a completely different point, that is, that you guys should be correcting each other here, and JasonS went after me when it was you that started the “you’re no BB Warfield” comment. We note that the reading ho esomenos, the future participle of eimi in its masculine, singular, nominative form with the definite article fits well the pattern of the Apocalypse and functions well as an adjectival participle to describe dikaios—the Righteous One who shall soon come to judge a most wicked world. 52 Robert L Thomas, Revelation 8-22: An Exegetical Commentary (Chicago: Moody, 1995), 255-6. As another note, for completion, in page 194 Swete mentions the unusualness of “Holy” as a title for LORD in the NT. And the one place where it is used (Rev 15:5) it it far more simply part of an adjectival phrase, not as a title, which is easy for use to see. In general, please allow me to have far more respect for the Greek and textual and consistency savvy and proficiency of men like Theodore Beza and Lancelot Andrewes than the computer and lexicon geekocrats who we see trying to dissect the Bible text today. Shortly is planned a summary response to the Damian overall summary above. He believed he was constructing a text from the available source not recording a perfect preserved text. Moreover Erasmus’ primary goal seemed to be a revision of the Latin based on the Greek, essentially the Nova Vulgata a few centuries early. Had the reformation not occurred he might have been successful. So I guess what substantial group holds this “historical preservationist position” and when? Let me provide a small bit of context here. Everyone should feel free to go to Kent’s site and read his stuff on history. I went right to Warfield for this reason. One of Kent’s claims is that Warfield overturned the historical bibliogical (spelling?) position by his reinterpretation of the Westminster Confession of Faith with regards to inspiration, inerrancy and bibliology. I am not convinced by Kent’s claims on that point, and side with Warfield and many others in not seeing an express perfect-preservation (we have all God’s words in our current Greek/Hebrew printed texts) view in the WCF. This discussion is moving out away from the Rev. 16:5 argument specifically. We can’t have the entire debate under every post on our blog. Let’s try to come back more to Rev. 16:5 if we can. But going back to Kent’s response once more. I want to stress that speaking generally, I have not seen a willingness to reevaluate things from Kent. He comes across pretty dogmatically set. That’s okay to a certain extent. And I realize there are exceptions and in principle we all are willing to be corrected by Scripture, I think we agree there. Just that his claiming we don’t reevaluate our position enough rubbed me wrong since it’s apparent he doesn’t do that much either. Again, I should be keeping this from becoming personal, but since it’s out here, I’m trying to explain a bit. A second and important point could be made on the NKJV here. (Here we go leaving Rev. 16:5, but I guess its impossible at this point…) Here’s the point, the NKJV was based on the 1815 Oxford TR from my understanding, and a different version of the printed Hebrew MT, but one which James Price has checked and found no differences in the Hebrew text at all except a few places where the NKJV adopted the MT reading more faithfully than the KJV. In other words, the printed MT version available in 1611 didn’t change substantially except in the footnotes etc., in the printed version the KJV used. This is as far as I’m aware from James Price’s explanations. With the 1815 Oxford TR, one of the claims people like us here on this site make is you can’t speak of “one TR”, you need to define which TR you’re talking about. There are differences. These differences are brushed off as being super minimal, and no big deal really. But now they are a big enough deal to reject the NKJV over. So if you reject it based on which TR it has, then you have to point out which TR is the perfect copy of the inspired original, then. And here is where your left backtranslating from English to Greek ala Scrivener, and Scrivener’s very own notes say that in places where the English of the KJV follows no Greek text at all, Scrivener just gives the Greek text of Beza’s 1598 and doesn’t go with the KJV choice. He lists forty or so places he views the KJV as being based on the Latin only. And then he says that list is certainly not complete. So by Scrivener’s own admission his Greek text does not equal the exact Greek basis of the KJV. So then we have the English church using the 1550 Stephen’s text as their “TR” and the European church preferring the 1633 Elzevir’s text, and we have the KJV translators using a mix of Stephen’s text and Beza’s 1598 text sprinkled with some Latin support and others, as the KJV did a lot of revising original material based on Erasmus’ text and etc. Then you have the 1815 or so Oxford TR which was an attempt to give the Greek basis for the KJV. Then you have Scrivener’s attempt at providing the Greek words behind the KJV. And we have a lot of confusion here as to which words are “THE WORDS” of the perfectly preserved autograph-equivalent. Okay I’ll stop here for now, but the above should be a separate post. We’ll see…. Quick response here to your original mention of Elzevirs’ 1633 having the reading esomenos. In looking at Michael Marlowe’s comparison of Elzevir’s and Beza’s texts on that point, I found that Elzevirs’ 1624 text has osios. Marlowe led me to search Google for a book by Herman Hoskier which includes appendices that expand on and correct in some points, Scrivener’s work on comparing readings of the various TR editions. I was happy to find Google Books had the work by Hoskier from 1890, which in Appendix B (just use this link, and search for “appendix” to find the various appendices), compares Stephens 1550 and Elzevirs’ 1624 and lists the support from other TR editions for any differences between them. Then in appendix C he lists the differences between the 1624 and 1633 Elzevirs’ editions. There I found that the 1624 text included the reading osios which Stephanus 1550 includes. The 1633 includes esomenos which Beza inserted in one of his later texts (and which is in the 1598 edition). Then the next 7 the Elzevirs’ editions all go back to osios instead of esomenos. I’m not sure exactly which the Elzevirs’ text was preferred, 1624 or 1633, but I think it was 1633. So I stand corrected on this point. It is interesting that only 1 of the Elzevirs’ editions has esomenos, and the future editions and later TRs like the Oxford 1815 edition side with Stephanus and read osios. When I have time I will include an update to this post to clarify my point about Elzevirs’ readings based on this new information. I still think my main argument stands, and we have a divided witness in the TR testimony over this word, and don’t have adequate external support for it to conclude it is original. Before this, have you read Warfield on this? Have you looked at the volume of his works on this? It doesn’t seem like it, because you aren’t expressing Warfield’s position on the Confessions in your comment. How can you argue that you are for Warfield when you don’t know his position? By the way, I’m not the only one who says that Warfield and Hodge changed the historic position, nor even the first. Read Muller’s Post-Reformation Reformed Dogmatics, Vol 2. He writes a long paragraph on this. So you are disagreeing with Muller too. For your scholarship credibility, Muller holds the P. J. Zondervan Chair for Doctoral Studies as professor of historical theology at Calvin Theological Seminary. His PhD is from Duke University. No one else has done the work that Muller has done on this. It is the definitive work on this. Maybe even that will be enough for your scholarship requirements, Bob. I think it is interesting that Steve proves your whole blog post wrong here, Bob, but then you still think your main argument stands. So even when you are given evidence, you can’t give in. If I was a secular scientist, I would applaud your dedication to forensics. The writings of the Westminster Divines which are many, which culminated in the WC, LBC. Is that substantial enough for you? Or do you look at Roman Catholicism as the true church? Thanks for tracking down the info from Herman Hoskier. Two technical points for now. You should point out that essentially there are 3 editions of Elzevir with variants, since all the editions after 1641 were simply identical. Not close, identical .. 0 changes. There was no new editing whatsoever, so they can only be considered a reprint (although, eg. the Preface can be different). As for Beza, my understanding, based on how I read the 1565 as an exception above, is that only the 1565 edition had the earlier reading. All subsequent editions had ἐσόμενος . This would be 1567, 1580, 1590, 1604 and the posthumous edition of 1611. However I grant it would be good to check, especially 1567, Jan Krans may be a good source for techie info. Note: Other editions attributed to Beza may have only been the Stephanus Greek text, if so they would not count as editions in this count. The special significance here is that Beza did on occasion reverse an emendation, yet he maintained the conviction expressed on Revelation 16:5.
like its Oxford 1825 ed. forebear, Scrivener’s text was created based off of the English readings of the KJV … no TR based off of the English until Oxford’s 1825 edition. … prior to Oxford’s 1825 TR there wasn’t a popularly available text that purported to provide the exact Greek basis of the KJV. later TRs like the Oxford 1815 edition side with Stephanus and read osios. For our purposes (the Revelation verse and general discussion) this appears to be an irrelevant edition. Oxford 1825 was used by Hodges and Farstad as a way to show Majority Text – Textus Receptus differences, probably because it was an available modern printed edition of a TR text. I know of no indication that the NKJV used this text to change their readings, the NKJV NT changes are in translation, not text. And I see no indication that this text was anything other than Stephanus 1550. So unless the posters who gave the quotes above have some new sources, every quote in between the ” === ” should best be considered inoperative. 1) The Hebrew and the Greek are inspired languages. In particular these languages have been molded by God, presumably to have content not present in the vulgar languages. 2) The scriptures are the originals. 3) That translation makes available some level of content, these are “acceptable” but not perfect. 3) to assert there are no existent originals. I don’t see how the WC endorses any of those positions at all. Now if we get to the TR vs. critical text at no point does Westminster endorses Erasmus reconstruction (Novum Instrumentum omne) as being correct. I don’t see how their position and yours are even consistent with each other much less identical. The LBC contains the same verse so the same argument would apply there. Mainly you don’t even know my position if you think I’m an English inspirationist or preservationist. And you don’t know what the Westminster divines, who wrote the WC, believed. So at this point we’ll just be talking past each other. You’re stuck on Erasmus, which is the canned CT/eclectic text argument that you are attempting to stuff everything into. 2) The scriptures when written predate the formation of the both the old and new canon (i.e. mid 3rd century at the latest). I’m not sure how they could have been more clear. As for Erasmus, well yeah that’s the point of this blog. For those who accept the Greek as authoritative then the question becomes which Greek text(s). Erasmus is the compiler of the TR, it is his text. interesting – an exegesis of the Westminster Confession! I agree that one cannot derive modern King James Onlyism from the WC or LBC and/or use them for a “historic basis.” However, your 5th point, “all English, Spanish, German. . .versions are translations not the scriptures themselves”, while true, is irrelevant concerning brother Kent’s position. His contention is that God preserved the scriptures in their original languages. He also would contend that the KJV is a faithful translation of all the words of God from Hebrew and Greek; there are no errors in the KJV. Though he cannot point to one source which contains all these words in Hebrew or Greek, the fact that the words exist (in mss, translations, versions, texts, etc) prove that God providentially and perfectly preserved His words, the words agreed upon by the churches. Is that a more accurate way of understanding your position, Kent? My problem is still this: much of that view rests on the idea that God’s words would be “generally available” to every generation (based on Psalm 12). Please define “generally.” Assuming Beza was right about Rev 16:5, the evidence shows the MAJORITY of Christians for centuries went without this proper reading. It wasn’t “generally accessible”. If you go to a Father or go to a version/translation like Latin and say, “see, it’s there”, then your point about preservation in the original languages is cancelled out. To try to find mss evidence to back this emendation is to engage in the textual criticism despised by King James Onlyists, is it not? I like to say English inspirationism or preservationism—it attempts to represent the positions properly. When I say no errors in the KJV, I mean that the translation is accurate. It doesn’t mean that I don’t think it could have been translated differently and still have been accurate. I can point to a source that has all the Words, Scrivener’s. And then I say that the KJV translators translated from something, and these are the forefathers of the men who wrote the Westminster Confession. Since I’m not searching for errors, since I believe in preservation and am not attempting to restore a lost text, I don’t care about Beza’s comment. I don’t assume that his is all the evidence there is. I find it ironic what a darling Beza has suddenly become to eclectic text people. And regarding that point, have you been reading Steve Avery’s comments? OK so there is an authoritative Greek. I think Bob et al. are doing a good job of presenting the counter evidence regarding the Erasmus’ Greek vs. NA27 Greek. In other words there is massive evidence that if a “preserved text” existed it would not be Erasmus’ text. Originally your point was that the confessions support your view, but I think my exegesis shows pretty clearly that the confessions hold to a view that the scriptures are an early collection of works In other words, the creeds you are pointing to are pretty clear that “God’s text” is what was written by the apostles, that is to say what was in use in the early church; and if the early and later church conflict the early church is to be preferred. Once we move away from the Greek to the translation of the Greek, I’d have to wonder what is the standard you would use for translation to determine “accuracy”. What does it mean when you say the KJV is accurate? Glad you liked. I was actually surprised how strongly the Westminster upheld the liberal position on biblical translation (consistent with the earliest, not evolutionary). . I’ve even written about the Fundamentalist Modernist controversy (link) and had never realized how much the liberal position was essentially creedal. I can’t reconcile the Protestant position with the rejection of the 12 classical deuterocanonical, the apocrypha. The rejectionists lost early in church history. What is generally available for almost 1000 years (at least in the West) was the vulgate. I agree with you there really is no way for a Protestant to untie this knot while believing in tradition without believing in further revelation. And lets not even get into the fact that the liturgy, which was far more readily available was often less faithful to the Greek than the Vulgate. Regarding the Oxford edition of the TR I’ve mentioned, I’ve been trying to hunt down where I heard it was an effort similar to Scrivener’s, to reproduce the Greek that underlies the KJV. I haven’t found the 1825 text anywhere online however. In the comments I called it 1815 or something, but you’ll notice in the main text of this post it is listed as 1825, so that was just a mental error in the comments. However, Maurice Robinson, an editor of the Greek Majority text, apparetnly is not aware of the 1825 text being similar to Scrivener’s as he doesn’t mention it here. Also, Doug Kutilek refers to the 1825 as being a reprint of Stephanus 1550, in this article. So I’m sure Price got his info on the 1825 from somewhere, I just haven’t tracked it down yet. In truth, my saying 1825 was the first available Greek text purported to underlie the KJV was motivated by being fair. I have in the past said the first such text available was Scrivner’s from 1890, but this pushes up the date earlier where Greek Texts were concerned with reproducing the readings the KJV used. It could be said to defend a widespread view of the authorized nature of the KJV for settling the Greek text question. Although I wouldn’t agree with that conclusion. Anyway hopefully that clears up where the details about the Oxford TR comes in. In the course of the discussion here it has been shown that the Elzevirs’ text of 1633 includes the esomenos reading. How does this affect my argument? It may be added that these five books are the only American representatives of the European textus receptus; and that not one of them is a perfect representative of either of the patterns–that is, of either the Elzevir of 1624 or that of 1633. They are apparently nearer the Elzevir of 1678, but certainly not identical with it. So the European TR is the Elzevirs’ variety, and the English TR is Stephanus 1550. So here he is saying the European TR is either 1624 or 1633 not just 1633. Later on there was an 1825 Oxford edition of the TR which apparently was either based on Stephanus 1550 or was based on the supposed Greek basis of the KJV. Then there was an 1873 Oxford TR which was quite prominent, and used as a text base for collations and compared against other readings in collations. That apparently was a reprint of Lloyd’s 1828 reprint of Mill’s 1707 text which used the Stephanus 1550 text primarily as its base (per Marlowe’s Textual Criticism Bibliography). So from all of this, it appears that primarily Stephanus’ 1550 text was considered the best representation of the TR. The 1624 and 1633 Elzevirs’ editions were also important, but the modern day TRs that are used for comparison with the Majority Text, or are used in Interlinear’s like George Ricker Berry’s, were primarily Stephanus’ 1550-based. Stephanus 1550 did not have esomenos. We can assume the 1825 and 1873 editions of Oxford TRs did not either. We only know for sure that Beza’s, Elzevirs’ 1633, and Scrivener’s TRs had esomenos. My article’s point about this was that the TR witness is split, and that after the KJV, people reverted to preferring osios rather than esomenos. This is still true with Elzevir’s 1624 and 1641 editions, and with the TRs widely used in the 1800s, with the exception of Scrivener’s 1890 text. Scrivener’s text continues to be avoided as a standard TR edition, except for those in TR only / KJV only circles. So Elzevir’s 1633 having esomenos does not materially destroy my argument. It weakens it somewhat I do grant, but the rest of the arguments from lack of Greek manuscript support, etc. still stands. Bob, I did not say that the 1633 was of essential importance, I was simply correcting an error, and noted that you had emphasized the 1633 TR. Simple enough, I only checked it because of your repeated emphasis. No, after the KJB 1611, English speaking people read the KJB 1628, 1639, 1762, 1769 etc. Until the decrepit revision barely an English Bible came out of significance and the few that did probably did not change Rev 16:5. Meanwhile a few scholars diddled around with the Beza and Stephanus and Elzivir and Oxford and later the Scrivener TRs (widely split as you indicate) and most of the time they would be referencing the TR to the English Holy Bible “our English Bible” “our version” etc. When you check the commentaries from 1611 to the 1800s like Poole and Henry and Gill and Barnes you find the English text of Revelation 16:5 without any attempt to change, even though Barnes and Gill especially would often semi-override the text because of textual aspects. As for James Price and the 1825 Oxford, I have often found his work to be unreliable, both in methodology and specific textual claims. Now we both saw many discussions about the 1825 being Stephens 1550. In addition I have been in touch with folks very involved with KJB editions and they have only discussed Scrivener as a KJB mirror edition. The circumstantial evidence at this time is that James Price simply has his facts wrong. I’m enjoying this discussion, actually. I was wondering if Steve and Kent would mind giving us a summary of their reasons to accept Rev 16:5 as it appears in the KJV? Why do I believe in the KJV/TR reading in Revelation 16:5? God said He would preserve all His Words (not a manuscript family, not one perfect hand copy). He promised they (those words) would be available to every generation of believers. He said He would lead His people into all truth by His Spirit. There is only one Bible, only one set of Words that represent the original manuscripts. There can’t be two. God’s Word is pure and perfect—that’s what characterizes it. The aforementioned so far is the agreed upon doctrine of Christians. People received what the Holy Spirit guided them to. The reading they received was the text of the KJV. This is what you see them quote and comment upon in multitudes of commentaries, in fitting with their bibliology. As an example, John Owen in vol. 9, quotes Revelation 16:5 and he quotes the KJV without correction. Kent, I didn’t realized you believed that John Owen is infallible! I’ve read comments like this over and over again on your own blog, but I’ve yet to hear a single discussion of that history in which God presevered his word. Your position is an incredibly convenient one to ignore AD 100- Oct 31, 1517. The day you actually take time to discuss thoroughly the believers who lived during that time and how in the world they could have even possible used the text used by the KJV translators is the day I’ll believe that you take the historical position on any subject related to the text of Scripture. If someone believes that God preserved them from the 1st century to the 16th century while copies were made by hand, and based on the promises of God, it really isn’t hard for him to believe that he still has them after the printing press was invented. You may want to stay involved in attempting to restore the Words that you think God lost even though He said He would preserve them, but I choose to receive the Words received by the churches that God promised to preserve. Related to Revelation 16:5, I can provide quotes of dozens of commentaries that accepted the same reading that John Owen accepted as God’s Words. You may believe it, but you conveniently never actually talk about what that looked like. Saying that the TR is the text received by the churches doesn’t make it true. And you have absolutely no reason to believe it is true other than the fact that the WC told you. My “beef” with you isn’t that you believe God preserved Scripture, but that you believe God preserved the TR. That is never said in the Bible. Scripture never told you that the TR is God’s preserved word. It just told you that God preserved his word. You have no historical basis for believing that the TR existed in any form, whether printed or copied, before 1516 ‘s. 1) You unintentionally deny that we have a historical faith, a faith grounded in history by thoroughly ignoring centuries (minus the Waldensians whom you seem to like) of that historical faith. For you, apparently, our faith grounded in history goes on pause between AD 100 and AD 1517. 1) You adjust your view of how God preserved Scripture (that’s what I’ve done). 2) Or you can “just believe” and move on and treat (practically speaking, not necessarily theologically — though perhaps you do; I don’t know.) the Westminster Confession as quasi-inerrant on the basis that the text they were talking about was the TR. As one who refuses to separate the intellect from the spiritual, Option #2 is both intellectually and spiritually dishonest. Option #2 does justice to nothing and I believe it makes a mockery of the historicity of our faith. And if that isn’t your position, I’d be incredibly curious as to what exactly is your view. PS – I don’t know why you have the idea that I think Scripture was ever lost. I don’t. Kent Answers: It’s not just the WC. This is what Christians believed on preservation. There is the unity of the Spirit on this issue. There is enough textual evidence for me, because I don’t rely on scientific presuppositions, but theological ones. Kent Answers: I believe that God preserved the Words that are in the TR. Kent Answers: I have enough historical basis. I come to my decision on the TR the same way that you come to our decision on 66 books in the canon. You consider that evidence. Kent Answers: Actually, every one of my beliefs has a historic basis. If we compared your and my doctrinal statement, I promise you that mine is as or more historic than yours. Kent Answers: You can’t prove this. Really you can at best make educated guesses. Kent Answers: They were speaking of the apographa. Those were the TR. I take the logic of faith that Edward Hills talks about. You also need to understand this is more than the WC. I have a huge amount of quotes from men of that age that backs up that I believe like they do on this. Kent Answers: Textual criticism is far, far away from the historicity of our faith. That is what is a mockery. Kent answers: Do you believe we possess the Hebrew words of 1 Samuel 13:1? To use commentaries as evidence is arguing from silence, however. Just as many a good pastor today would ignore discussing a textual variant with his congregation in favor of teaching the point of the passage (which remains the same regardless of the variant), so too many a commentator wouldn’t bring it up. A search through history would find others who accept this. All the faithful preachers using the Vulgate before Beza’s work, would have used “holy”. I don’t think Mike was asking for a statement of belief. He was asking for a timeline. Something that for example would answer the question if an 1150 resident of Aquitane wanted to get a copy of his perfectly preserved unified God’s word what book does he grab? What about an resident of Bavaria in 820? In other words if preservation in native tongue is true than there were readily available bibles through the thousand plus years of Christian history when Koine Greek fell out of usage yet before the Geneva bible. If the KJV is “preserving” a text what text is it preserving? Steve did say that Gill mentioned it. You may want to reread all that he wrote before you make that accusation. It is a false accusation. My statement of belief is my evidence. Just like it is my evidence for a 6 day creation. Just like it is evidence for my justification by faith. Abraham didn’t have any evidence when he left for the promised land, except a statement of belief. On more thing for Bob. If you believe that the Word you are preaching isn’t God’s Word, then you would be dishonest. They didn’t discuss textual variants because they received the Words. They were not, like men today, attempting to canonize scripture on the spot. It looks to me like he was saying even though Gill and Barnes normally semi-override the text, they didn’t with Rev. 16:5. In actuality, Barnes doesn’t override the text, Gill does, however. I didn’t throw out a false accusation, I said “Avery implies [Gill] didn’t”. I am fine if Avery clears things up and says he didn’t mean that with his comments. I’m not above being wrong, but this is not a matter of me not reading Avery’s comment. I know you were joking, Mike, but obviously Kent doesn’t think John Owen is infallible. He’s providing evidence that Christians have accepted a certain reading, and based on the fact that the church is led by God to His own words, that is his proof that those words (particularly the ones in question, Rev 16:5, KJV) were accepted. Of course, this is still problematic. I’m trying to understand this logic here. Many, if not the overwhelming majority, of Christians accepted the words underlying the KJV between 1600-1800. That proves the KJV? Why this time period? Erasmus didn’t initially accept I John 5:7. Luther didn’t either. Erasmus didn’t accept Rev 16:5 as the KJV translators did, neither did various editions of the TR. The Latin with which most Christians would have been familar didn’t either. Why can’t these be counted as “historic”? I feel that Kent is working backwards from the KJV. Now Christianity, as a movement, is growing more and more sensitive to the reading as found in the modern versions. So has the biblical presupposition of God guiding His church to His words been nullified? It seems in the 2,000 year history of Christianity, there is one era in which one reading is considered authoratative, and that seems to settle the question. Now I would expect a rebuttal of the church is now apostatizing in other areas, so it can’t be trusted. But, for one who disagrees with Owen, and Turretin, and the Westminister Divines, and the KJV translators on various other doctrinal issues, I can’t see how this argument can be consistent. Bob, Gill’s simply giving other variants is not an override, he does that frequently with some discussion. On occasion John Gill speaks in a way that shows that his preference is the other variant (he was not remotely of KJB or TR conviction) he did not do that in Rev 16:5. However, I could have more precisely mentioned that John Gill does gives the variant with a mini-comment, however he does that on hundreds of verses without struggling with the text. Damien, as for a summary of the simple conviction that Rev 16:5 as in the KJB is the word of God, I will try to do that shortly. Please understand that the exercise above (the posts) was not remotely to convince anyone of Rev 16:5 as the pure word of God (precept upon precept, line upon line .. a modern version aficionado would never be expected to receive such a truth) .. simply to show that the evidences were far stronger than implied in the agiprop we see against the KJB focusing on the verse, which tends to very shoddy scholarship. And that effort to give a balance and perspective I believe has been successful. And the thread spurred me to dig a bit deeper, which his always wonderful with the word of God. Just one question. The modern textual critics/translators admit the Hebrew words in I Sam 13:1 aren’t anywhere to be found today. To me, that seems more of a problem to your position than it would be mine. Since I take more of a “word means revelation” approach, the “words” could be preserved in any language. If a translation wants to employ a lectionary, version, father, etc that is in a different language for the evidence, that’s fine with me. But I remember that your position says God keeps His words (ipsissima verba – the very nouns and verbs) in the original language. So wouldn’t 1 Sam 13:1 be a problem since the Hebrew isn’t preserved in that case? I just changed the reply feature to just go 1 level deep (instead of two). I’m hoping that helps some with the “reply” feature being difficult to follow. I’m hoping I didn’t just ruin a bunch of comments however…. It looks to me that the reference to a Textus Receptus from “Oxford Press in 1825, and subsequently revised and edited by F. H. A. Scrivener in 1894.” given by James Price, and similar references from Daniel Wallace and Doug Kutilek, are not accurate. There is a 1834 Pitt Press (Cambridge) edition of the TR, Greek with AV in parallel columns, mentioned by Scrivener, edited by James Scholefield, and to which he added marginal references in a later edition. Also printed 1836, 1850, 1857. The is a Stephens edition with some changes, given by Scrivener below. Greek and English Testament, in parallel columns on the same page. Edited by J. Scholefield, M.A. late Regius Professor of Greek in the University. New Edition, with the marginal references as arranged and revised by Dr Scrivener.